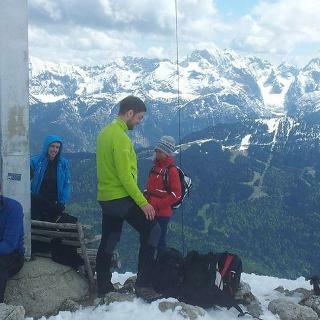 / Von der Kriegergedächtniskapelle genießen wir eine herrliche Aussicht. / Ein Kreuz ziert den Gipfel. A nice tour at the foot of Mount Kramer with beautiful views and along well-maintained hiking paths. There are no major ascents or descents. You have numerous possibilities to make the tour shorter by using one of the paths leading back into the valley. 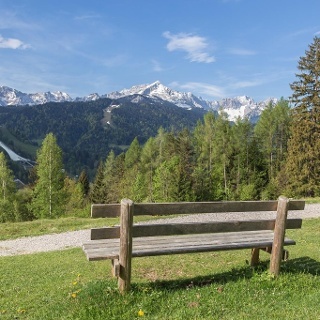 On this hike, you will discover the old centre of Garmisch. Take your time for the traditional facade paintings, the so called Lüftlmalereien, to spot the details and the often symbolic character of the paintings. The route will then continue uphill to Mount Kramer. Walking on the southern slopes of Mount Kramer, you will reach Maximilianshöhe and its popular Alpine hut “Almhütte”. 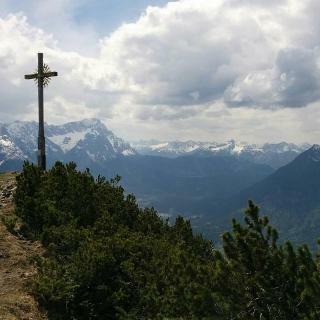 On your way back, you will see the memorial chapel for soldiers (Kriegergedächtniskapelle) as well as Garmisch’s old church “Alte Kirche”. This church is very interesting because of the rediscovered 15th century wall paintings that were created long before the Bavarian baroque era. 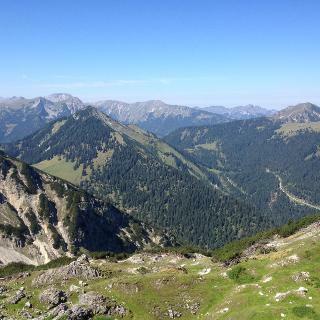 This is why the discovered paintings are something special in the north of the Alps. For a more detailed description of the tour, please refer to "PDF Print" above. The wall paintings in the “Alten Kirche” are very special and beautiful. Starting at the parking area, walk along Alleestraße until you reach the Loisachbrücke. On reaching the bus stop, cross Promenadenstraße and then the Loisachbrücke to the right. Walk a short way along Fürstenstraße until turning left onto Frühlingsstraße. Turn right when you reach Kramerstraße. Follow this road “Am Feldkreuz” and the bend to the right until you reach the hiking path at the Kramerplateau. Follow this uphill path to the right and then turn left after a short time in the direction of Maximilianshöhe. 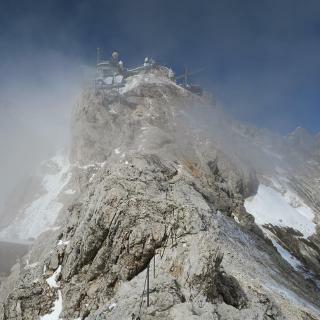 Turn left when you reach the Alpine hut “Almhütte” and circle the Maximilianshöhe. This way, you will walk back on the already known part of the Kramerplateauweg. 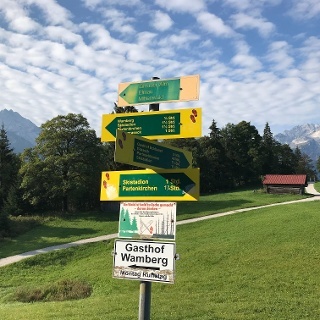 To get back, turn right to the memorial chapel for soldiers (Kriegergedächtniskapelle) and via the slopes of Mount Kramer until you reach Brauhausstraße. When you have reached the valley, turn right and walk back via Brauhhausstraße, Lazarettstraße and Fürstenstraße to the Loisachbrücke. There is an hourly connection between München Hbf (Munich central station) and Garmisch-Partenkirchen. Board the local bus (routes 3 and 5) to Loisachbrücke. 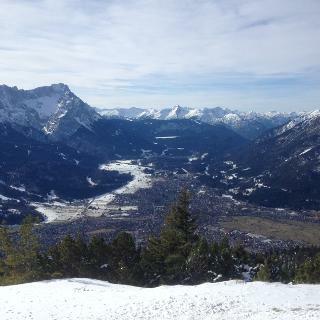 Take the motorway B2 to its end at Eschenlohe and continue via state road B2 to Garmisch-Partenkirchen. After the tunnel, drive in the direction of Garmisch, via Burgstraße and turn left at the big intersection at the Loisachbrücke (Loisachbrücke) into Alleestraße. After about 300 m you will see the parking area on the left hand side. 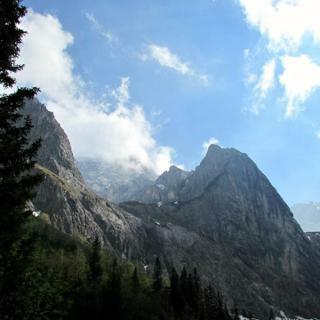 From Mittenwald, take the state road B2 until you reach Garmisch-Partenkirchen. Continue on the main street and turn left onto Hindenburgstraße at the 5th intersection with traffic lights. Turn left at the next intersection and turn right onto Alleestraße when you reach the bakery “Bäckerei Müller”. You will see the parking area on the right hand side.